The tree I landed on wasn’t the largest trunked of the bunch and was more literati in its configuration. It seemed it was going to be a challenge to work with in creating a decent design, in other words it was right up my alley. For a moment I was a little concerned until I realized what was there. As the workshop began David walked around helping people to find the tree in the material, but I knew right away what I wanted to do. By the time he got to me I was well prepared to show him what I had found and after looking over the tree and turning it and looking from many angles David concluded I had indeed found the best image for the tree. I didn’t work on the tree too much in the workshop. I had found its image and I was happy. I did perform a major bend using the bright orange bailing twine that is so iconic of work at Elandan. In the picture below you can see me and David discussing the bend I was going to perform, to tell the truth I don’t think he thought I could do it. The branch needed to be bent severely to bring the foliage at the end around to the front of the tree. While wrapping the tree and applying that large gauge wire required for the bend I continued to listen to David giving advice to the other workshop members. This advice turned out to be great and was well worth the workshop alone. I’ve taken my time with the larch and enjoyed keeping it healthy and lush. 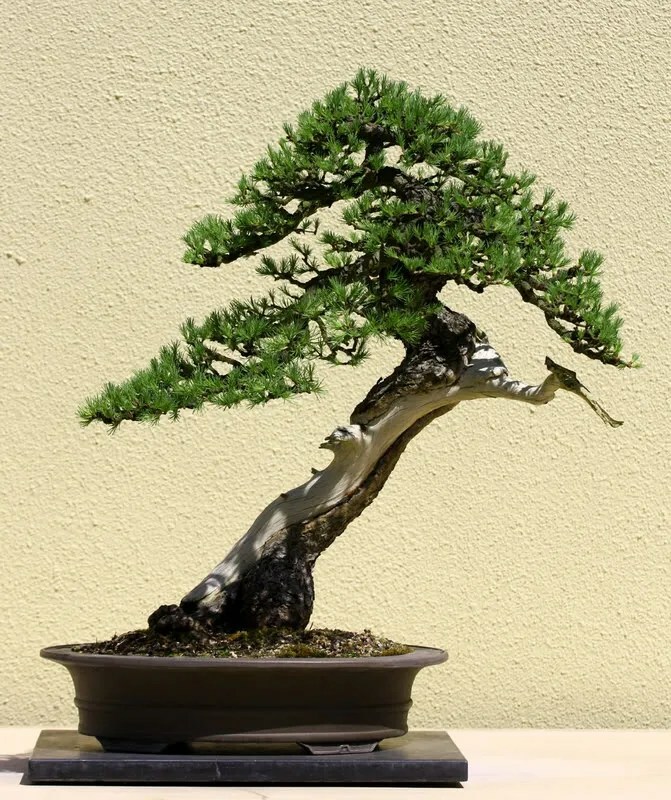 As we know from the seven stages of bonsai it is extremely important to work on healthy trees to get the most out of them each year. The first year with this tree was spent letting it grow strongly to set the few major movements that I added and to heal the large bend I made in the side branch. Being larch is extremely flexible and with the tree growing well that year it healed and had set by the next spring. It was then moved and potted into the pot you see it in the below pictures. 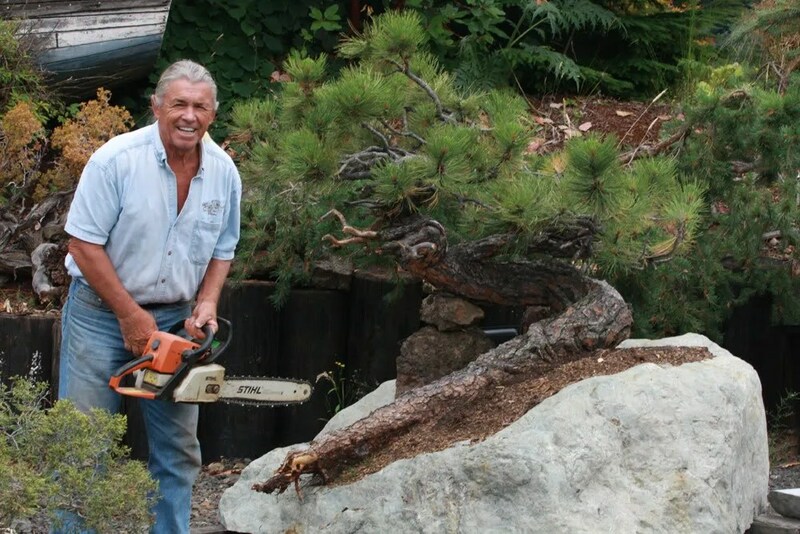 After collecting the tree David had placed it in a large tub with pumice surrounding the original soil. Having let the tree grow strong for an additional year before potting it allowed me to remove almost all the original soil. 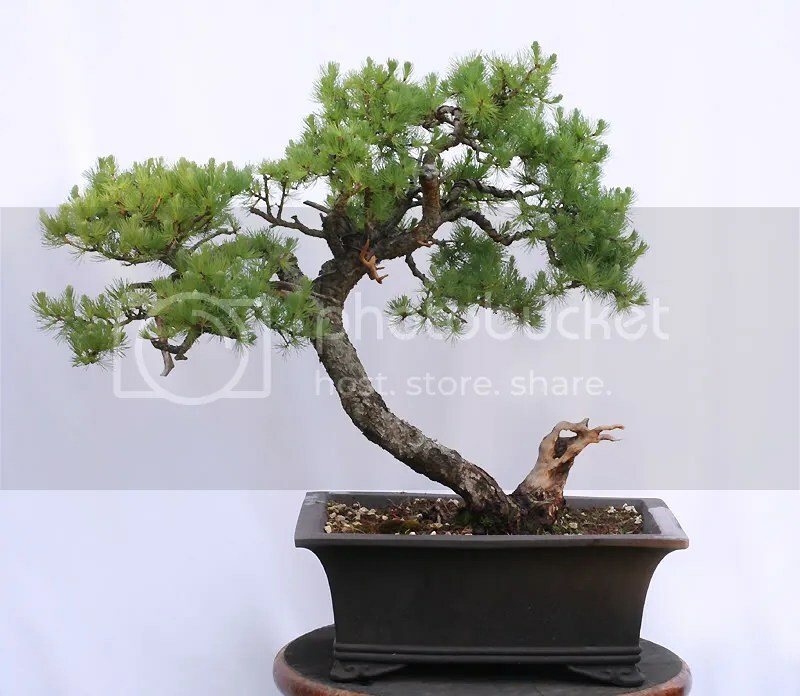 It was potted into this pot not for show but as a suitable solution for the time being as it was the best size to allow the tree to grow freely for an additional year. 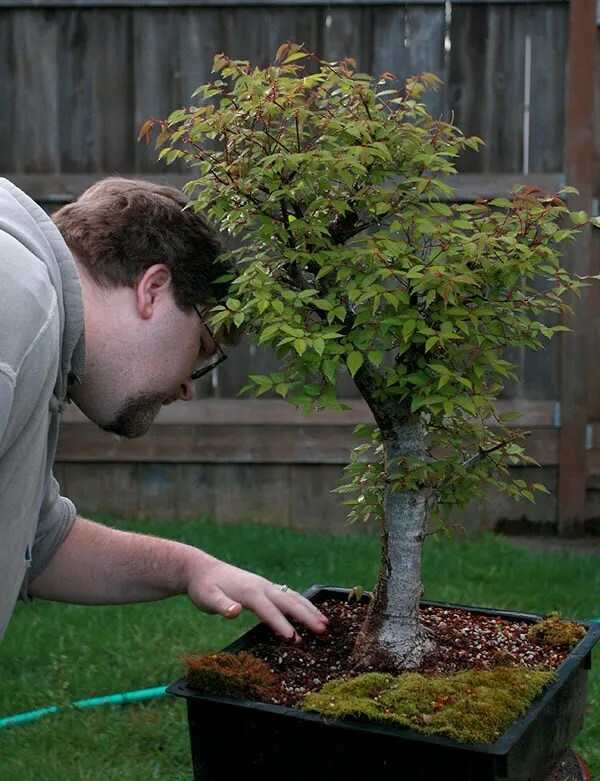 The tree was potted into free draining bonsai soil and watered and fed well to encourage more growth. No additional design work was performed. The tree grew marvelously and has filled the pot with roots. Last fall some carving work was done on the large deadwood section at the base (you can see it under David’s elbow in the above picture) more detailed work will continue. A few days ago, as spring was getting all sprung, this guy started to leaf out. It comes out a little later than its Asian counter parts but that blue green foliage is so very much worth the wait. I took the next step in wiring this tree and placed some more of the large foliage areas while reducing some of the unneeded extensions as well. I’ve been back and forth on which side I like the best, but for now this is the front. I will be removing the left section of the tree sometime this year, it however is currently being left on to encourage a little more strength in the tree. This winter will see the fine wiring and next step to that final refined image. 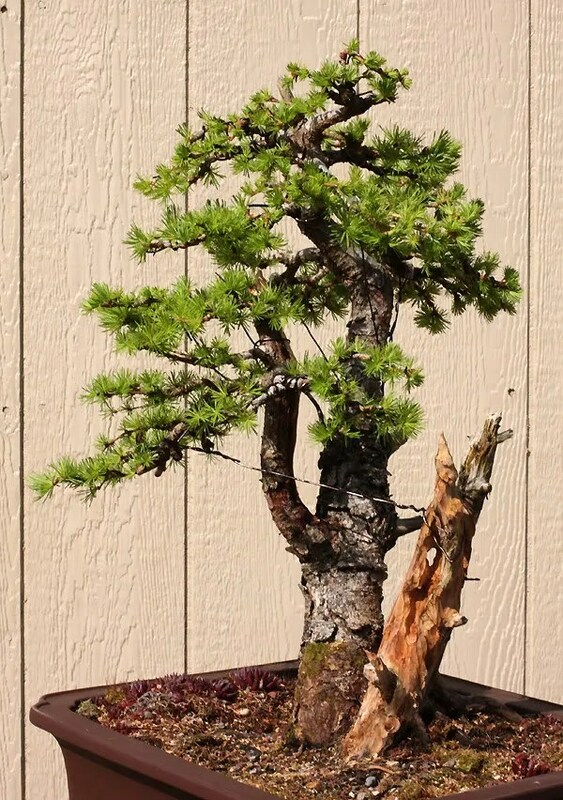 Larch after three years of patient slow work. Left side will probably be removed. As always comments, questions and discussion are always welcome and encouraged. I adore Larches… the first time I found out a conifer could blow it’s needles and enjoy a winter silhouette I was hooked. 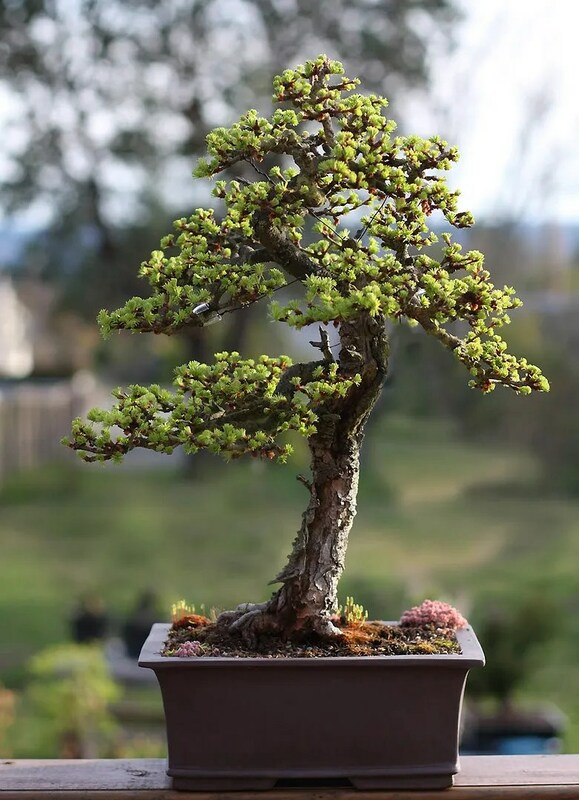 Then I saw the Nick Lenz Larches at the Pacific Rim… one of which ranks as one of my favorite bonsai of all time. There’s something so perfect in being able to appreciate the chartreuse glow of new foliage on a early spring evening that I find captivating. So needless to say we have a few in our collection, and one that I’ve always enjoyed having was one I picked up a few years ago. 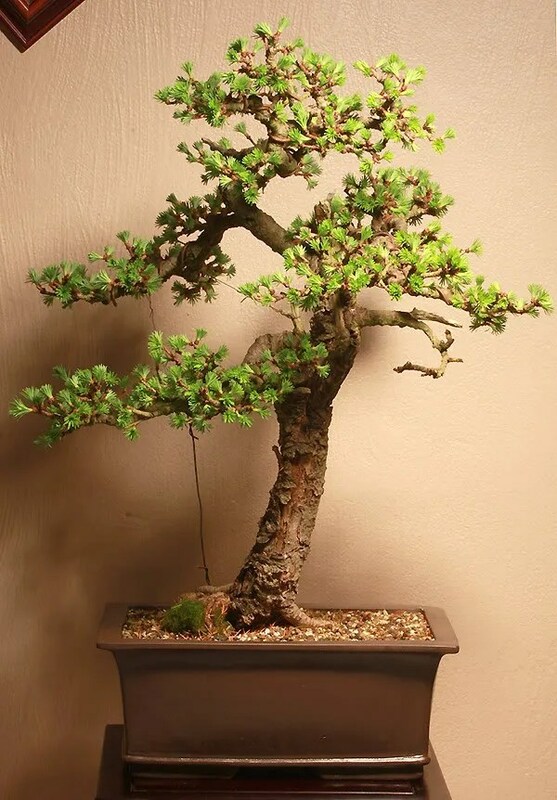 It was started from seed to be bonsai, and was originally a workshop tree that apparently Daniel had helped style initially… then much later it came to me in 2009. I liked it because the lines reminded me vaguely of the Lenz Larch at the Rim. I ended up working on this larch the same day Eric was working on his new larch shown in the post before this one. I was enjoying the April sunshine watching Eric work, and I kept looking at this larch. I had some heavy copper wire that had to come off of it that had been there since we got it. It had been loosely applied, but it was now time to come off. I actually had to buy a pair of mini-bolt cutters to get it off, since traditional wire cutters just weren’t going to cut it. After I got it off, I had an opportunity to evaluate the tree in a whole new way, because I could move major branches. I looked at Eric and told him not to get any ideas about it, because I saw what I wanted to do with it. He suggested I just get on with it… and so I did. Needless to say I am deeply delighted with how it looks, and when I dug up that older photo, I was surprised at how much it had developed in that time. We’re so close to our trees sometimes, it’s hard to really grasp how much they change under our care in so short a time. I hope you enjoy it as much as I do… and the moral of the story is, in whatever way you can… photograph your trees even if you don’t think they look like much, you’ll be glad you did later. As you might remember from Arrival of a Larix we received this larch some time ago. I finally decided to set out to work on it this Saturday as it was a nice day out and this guy was just looking like he needed some attention. A quick review of how the tree looked before work began. The first order of business was to begin working on the deadwood that is on the tree. The current state of the deadwood was a little spiky and out of place. I began by reducing the height of the main deadwood section. As I began sculpting the deadwood I discovered that parts of it had become punky and moisture was beginning to eat away at the base. This is of course a major concern when there is deadwood that reaches to the soil surface. The punky wood was removed using the die grinder and the rest of the initial carving was completed. The wood will be preserved using lime sulfur that has been diluted and had ink added to it in an effort to reduce any stark contrast in color. After the initial carving was complete I was able to begin working on changing the structure of the tree. As you can see in the above image the initial image was that of a young tree with strong apical growth and the foliage pads were very linear and flat. These were two of the most important aspects that needed changing to help portray the look of an ancient conifer. 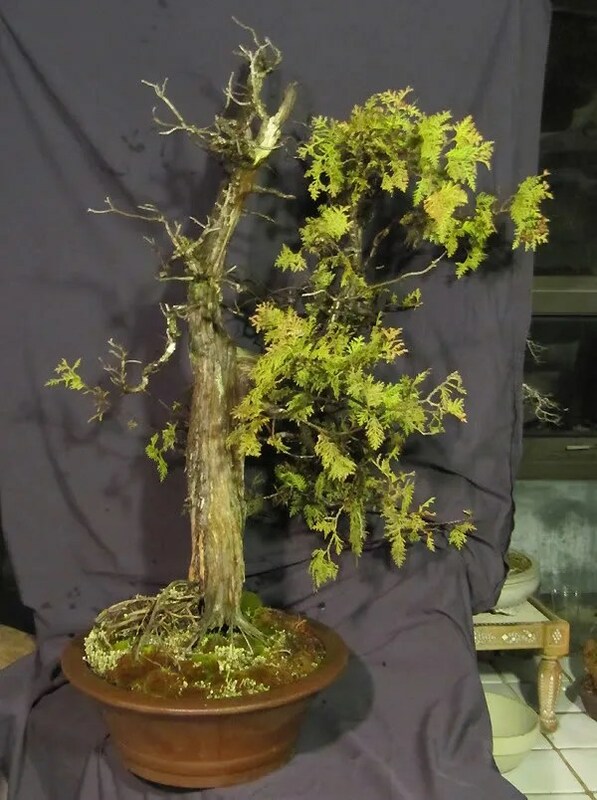 The good news is that larches in particular are very flexible and forgiving offering the artist a great deal of latitude in the placement of the branches. The tree was heavily thinned and compacted to help create a tighter more masculine image and to evoke more of the alpine shape that would be natural to this tree in many surroundings. The image after styling. A different front was found that showed off the deadwood better and provided a much more interesting focal point. With the initial styling complete the tree will be allowed to recover. The next steps are to create more definition and interest in the deadwood as well as to create more ramification in the branches. Refinement of the overall image will take probably the next 2 to 3 years. We thought it might be fun to show some of the trees that Daniel has been working on. He began working on this tree the other day and wanted to share it with everyone. 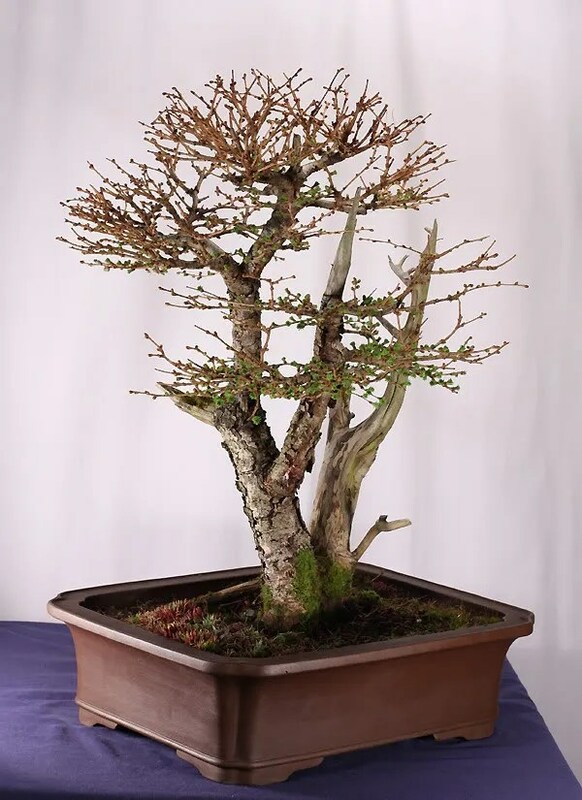 Thuja Occidentalis (Eastern White Cedar) is a tree that doesn’t get too much play as a bonsai specimen however it has wonderful character and excellent foliage that lend themselves to bonsai culture. Here you can see the tree before Daniel started to work on it. It had gotten a little hairy in the last few years and was ripe for an evening of work and transformation. Working on the tree in the evenings as Daniel often does he completed work on the tree in a few nights. It is important to note the amount of foliage that was removed as the tree is rather vigorous and controlling the planes of the foliage is very important. Also as the trunk of the tree is the main focal point here with its gnarled undulating deadwood the foliage needs to be subordinate to the trunk to carry out the intended image. The tree after a few evenings of work. Notice how the foliage is subordinate to the trunk (focal point). Some shots of the beautiful deadwood that is carefully sculpted and exposed. These are the parts of the tree that give it its feel of truly ancient age. In the above photo you can see the heal marks that created callous and how how that has receded with the death of those areas. This is something we see often on very ancient trees, the receding of the live vein as it ages. Here you can see the sculpted ancient hollows that show the skeleton of the tree. We certainly hope you all enjoyed seeing the changes to the tree. 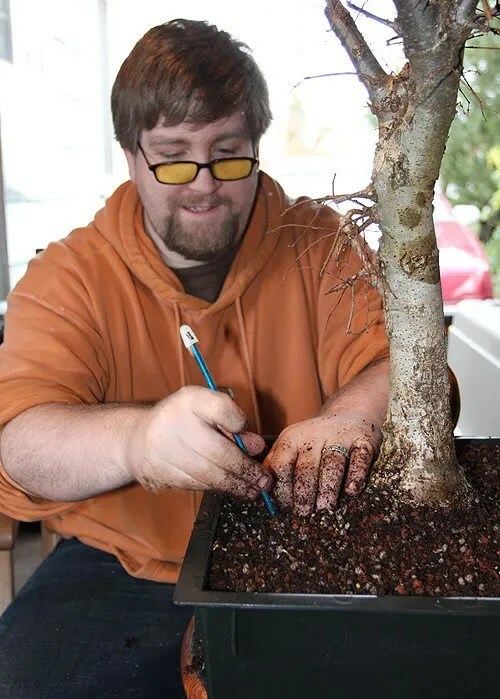 Daniel always loves to share his work with others and inspire bonsai people to spend time working on their trees. How fitting that the last image in the previous post be of the tree in this one. We didn’t plan it that way… I promise! Creating that essence of age that we strive for in deciduous material is a combination of several tasks over the course of many years. In the early years it is important to impose interesting movement into trunks or sub-trunks and secondary branching with the use of several wiring techniques. I won’t cover those here however our friend and “bonsai bum” Will Hiltz has written an excellent article on a technique that Daniel Robinson calls “baby bending”. You can read the article here . This technique was applied to the tree you see below for many years developing the sub-trunking and secondary branching that is evident. It has been detail wired at the tertiary level on several occasions and the time came for it to be done again. After re-wiring two of the other hornbeams in the garden Daniel asked me to take on this tree. Of course doing so meant I would have to take the tree home with me. It is one of a batch of trees purchased in the early 90s at Brussels’ and is the largest in the collection. I accepted the challenge to work on the tree as I have a somewhat personal relationship with it. This tree is one that for me stands out amongst the crowd. I can’t help but be in awe of it every time I spend time with it. The aged bark and gnarled branching give me the feeling of a tree that has seen the great passage of time. In wiring it I didn’t want to lose this feeling however I wanted to create the limited sense of order in the branching that inevitably helps frame the rest of the story. It is important to impose a sense of age to the tertiary branching that is commensurate with the rest of the tree. To do this one of the most important elements is to add a sense of wandering to the branching. We see in ancient trees that the tertiary branching has movement toward the outer edges but that it is not entirely linear this is the “wandering” that I am talking about. 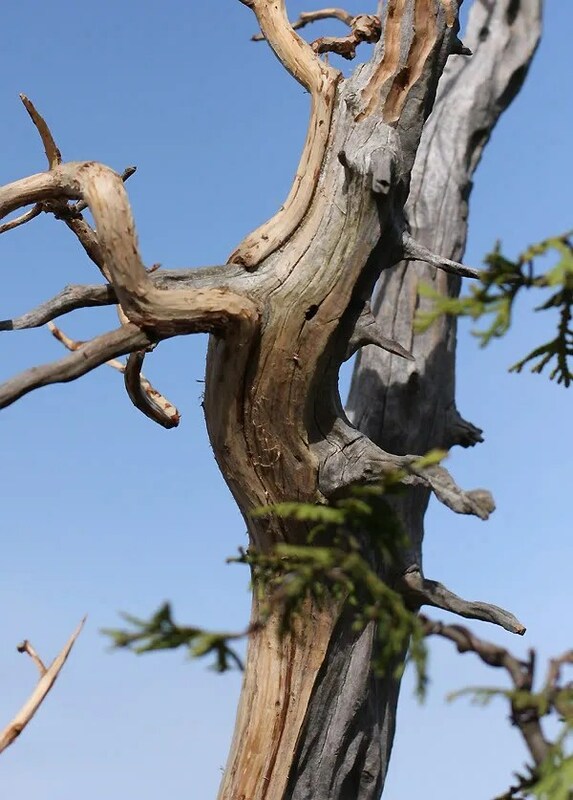 Many events have occurred in the life of the tree and a slowed growth habit along with recovering from these events will shape every part of the tree including the fine branching. 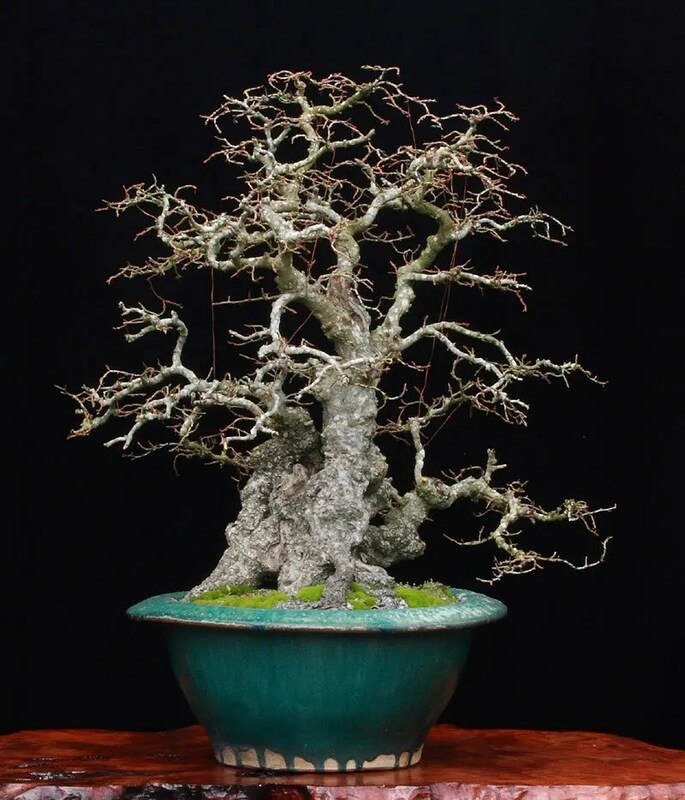 Since one of the goals of the wiring was to add not only movement into the branch settings but a sense of age, this meant that the branches needed to have a downward overall movement to them. Forcing all the branches to just move downward however would not create the layering effect that gives life to the foliage. To create the sense of depth and layering in the foliage it is important that we realize that even in the sections of a branch there are additional apices. As you look at the completed work one thing you will notice is that with the organization of the branching it has become more clear that each subtrunk has on it several apices. These multiple crowns add to the sense of age as opposed to the youthfulness we might see in a delicate thin trunked mountain maple image. This is part of what makes trees like this one feel so natural. What is hard to see in the above image is that not all the movement is on a single plane. To give volume and shape to the foliage it needs to have movement in all directions. In the lower sections of the tree this is less pronounced but still visible. The final image reminds me of a wild and natural ancient tree while still having a sense of balance between chaos and order. Of course the pot here lends some information to the ideals behind part of the styling as well. A beautiful antique Chinese pot, the planting may seem odd for many people however the deeper aged pot helps lend an aesthetic feeling of timelessness to the tree. An overall image that , at least to me, is pleasing. The tree has since been returned to Daniel at Elandan Gardens, where it lives and can be seen on display. questions and comments are always welcome….. please feel free to join in! Recovery: The period of time between activities in which the tree is expending energy on healing and sealing wounds, or on regaining strength post damage. Once a tree has been worked over (especially its roots) leave it alone for several weeks. Water it of course, and protect it from weather… but don’t feed it, and try not to move it around too much. Just let it be. 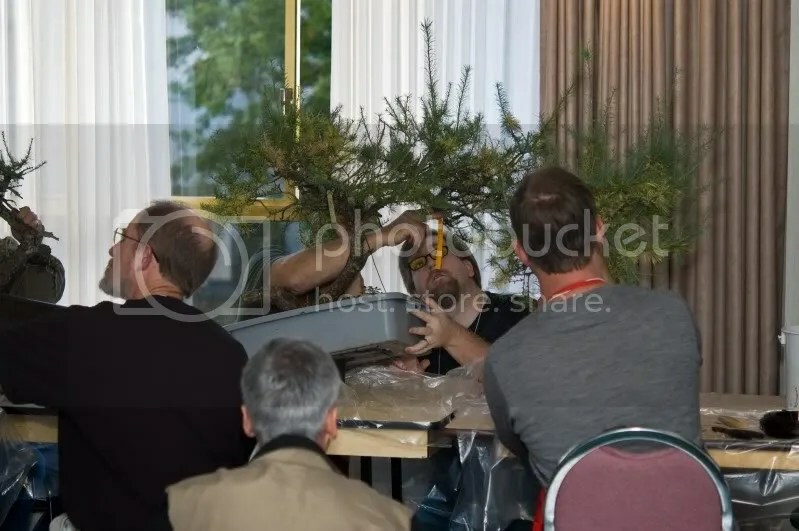 There is such a thing as loving a tree to death, and fussing around with a tree after it’s been through the equivalent of internal surgery is a very good way to bring that about. If you decide the next day that you don’t like the new position of a tree in its pot… you’ll need to fix it in a couple of years, so be sure before you set the tree into its new position. The Golden Rule of Pines: Do only one major process in a given year. Either style it – or work on the roots – but not both in the same year. This rule can be a safe guideline to follow for most any tree, especially if you know little of the tree’s past. Certain species of elms (Zelkova) when in good health can handle having their roots as well as their foliar mass savaged in the same sitting. Trees like those are tough as nails, but again it’s all about knowing your tree well. 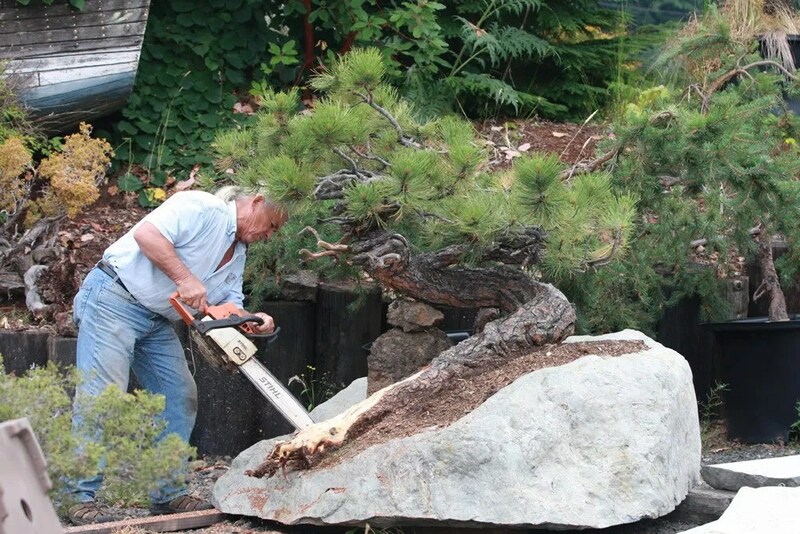 There are those for whom a lot of the rules of recovery don’t apply… and they tend to be professional bonsai growers. Mostly that is because they have available the facilities to very carefully manage a tree’s environment and thereby it’s recovery. Dormancy: The period of time when all activities of growth are slowed or stopped. Most pronounced in cooler climate species which drop their leaves; even tropical’s have slow periods of activity before they enter another growth period. This period of rest is very important in helping trees prepare for the next active growth season. Meeting dormancy requirements often means northern tree species will not long tolerate being in a warm southern climate, where the dormancy period is short or non-existent. Larch (Larix) is an excellent example of a northern tree which is difficult to keep from the Mid-Atlantic States south. Dormancy is entirely related to regional weather patterns. Being aware of , and working with, the species which grow well in your area will help you meet this basic but important need, and have greater success in keeping trees alive and healthy where you live. When a northern climate tree is dormant, do not feed it, and watering is generally kept to a minimum. Protection from wind and deep freezing beyond the tolerance of the species you are working with, are the only things which you really need to worry about. Packing your trees with snow around the base of the tree and around the pot is a great way to keep the temperature of the pot from dipping below 32, and will keep your soil evenly moist. To help trees prepare for dormancy feeding 0-10-10 fertilizers will help harden off branches and strengthen roots for its winter rest. This should be done in the late summer when you have stopped feeding nitrogen rich fertilizers to slow down foliage growth. Dead: The most important thing to know about “dead” is that dead does not always mean dead. Even trees can have near death experiences only to pop back unexpectedly. More than one tree has been added to the debris pile when its pot is being reclaimed only to have the owner find that the tree decided to sprout again with no intervention from them. Beyond loss of foliage, generally you’ll know death or dieback has occurred when branches are no longer turgid but rather get a puckered appearance, similar to a grape turning into a raisin. Or when you scratch test the tree, there bark resists or is difficult to scratch and has no green under the cork or thin skin of the bark. When “dead” happens the thing to do is assess why it might have happened. Look back over the care and environmental conditions along with inspecting the tree itself. Check for disease, or environmental damage. See if there was a lack of rootage, or obvious root rot, and use that information to help you prevent it in the future. If you isolate that a pest or fungal disease may be the cause of death, immediately (after sanitizing all tools and your hands) inspect any other trees in proximity to the affected tree. If you are not sure how to handle a disease/pest, get experienced advice as soon as possible, as cross contamination happens very easily. Though often challenging to deal with, fungal and inspect damage is easiest cured in the early stages. In closing… Knowing your tree well, as a species and an individual tree, before ever doing any heavy work is often a key to success. Rare is the tree which we will perform heavy work on that we have not had for at least a few seasons. That time lets you know how the tree reacts to your regional environment and set-up, and gives you a better chance at understanding the reactions the tree will go through as a result of that work. Though I admit it can be very hard to wait! That pain is lessened by having enough trees to keep you occupied until you feel confident about the tree(s) which were recently added to your garden. One nice thing to know though is that experiance with a species will tell you when you can speed things up. And finally, be mindful not to be SO careful that you let fear hold you back from doing the work that needs to be done. That will halt your progress faster than anything. The omission of specific pests, diseases, fertilizers, soil composition and other hyper detailed information has been intentionally left out as it would not be possible to explore those things in the context of an essay. Most of all enjoy your trees… the more time you spend with them, the more attuned you will become to their subtle changes and needs. Stress: The effect of various impacts both intentional and not, on a tree. When stress turns into distress is where you have a problem. 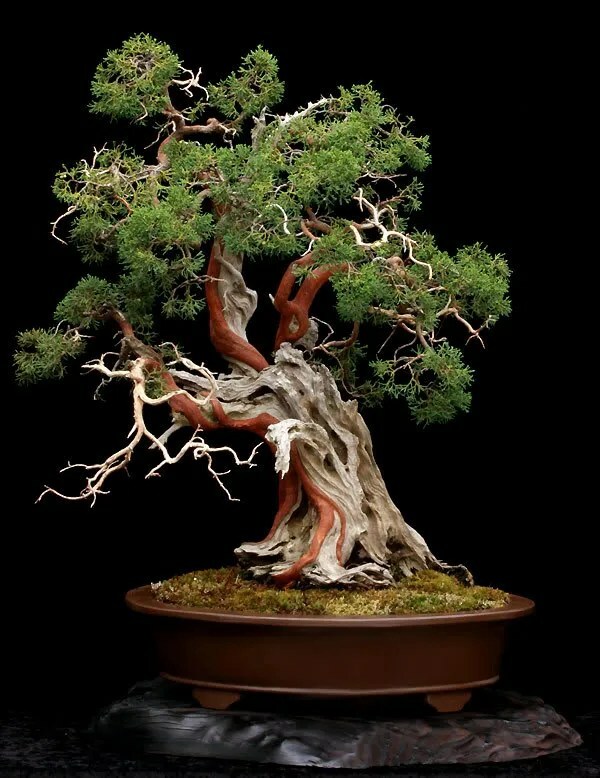 Almost everything we do to trees in bonsai horticulture is a form of stress. Knowing how far to take any given activity at a time is the key to keeping the tree in a place where it can recover from the stress and move forward in its development with active growth, or with mature trees, remain in stasis. Insufficient water stress is easy to spot in deciduous trees because of lack of water will cause wilting in the leaves, and eventually drooping in branches that have not lignified (turned woody). Eventually the drooping foliage will fail and die off, indicating advanced stress. Pines are less susceptible to stress from insufficient watering as they have the ability to collect moisture from the air and dew around them, but all conifers will suffer from long term deprivations as readily as any deciduous tree. 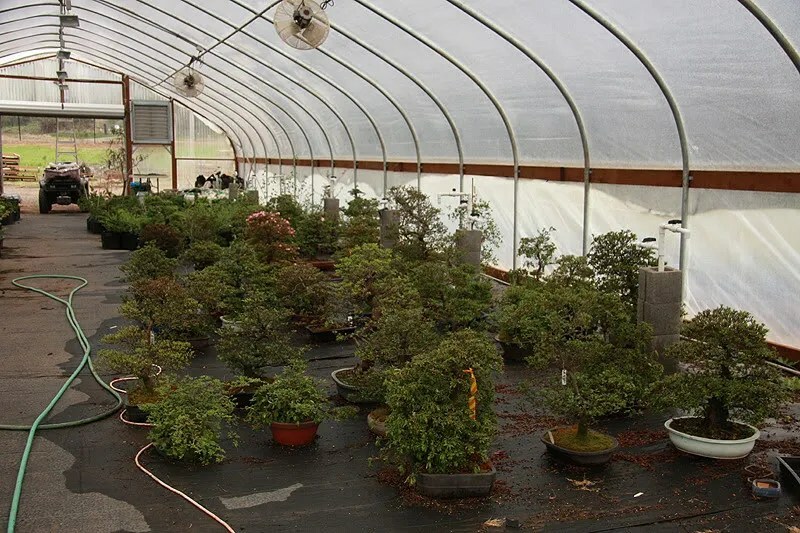 Responding to water deprivation involves letting the tree and pot be submerged in a tub for at least 15-20 minutes when you discover the problem. This isn’t so much to hydrate the tree as it is the soil. Soil which has been allowed to get too dry is less prone to retaining water. For most new learners, under watering is a major problem as surface soil is often misleading, and what seems adequate is actually masking dryness deep in the pot. Also not watering thoroughly to the point of draining out the bottom of the pot can mean not all areas of the roots have actually received water. Stress from too little water can be caught and corrected, and if not protracted – have minimal long term effects. The stress of too much water will often manifest as yellowing then browning tips on leaves and needles. Stress from too much water indicates poor soil conditions where there is too much water retention and not enough air. If you have a good soil mix which is free draining, stress from over-watering is almost impossible. But this kind of mixture is comprised almost entirely of non-organic components. 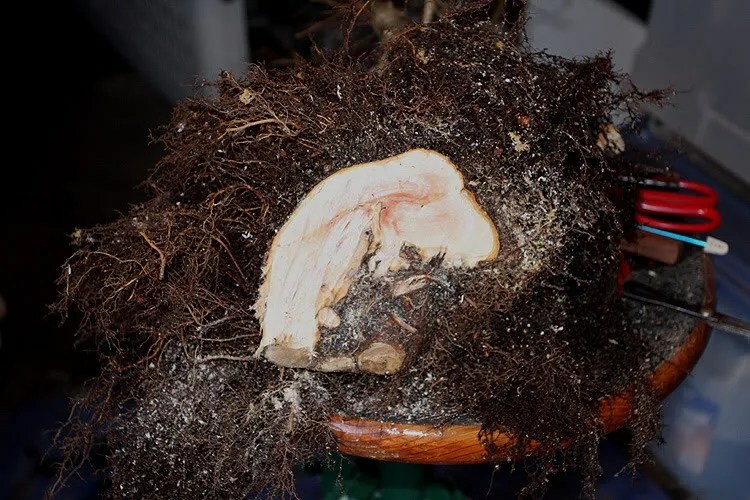 If your soil has a lot of organic components overwatering can be a harder problem to correct as by the time the problem is discernable, you often have damaged the root system. This can require significant intervention to correct and you should seek species and season appropriate advice from someone familiar with the species. Stress from too much light can result in dieback and overall browning of leaves over whatever area is facing the harshest sun – the leaves can seem crispy and brittle. This can also happen as a combination of too much sun along with not enough water. A tree in the ground is more resistant to sun scorch as it has a larger area from which to pull water and will extend its roots to find that water. Thereby preventing the dry out that hastens sun scorch. Certain thin barked species like maples can be especially susceptible. Before placing your tree in full sun, be sure that is an appropriate placement for the tree. Be aware that even the bark on a tree can burn. 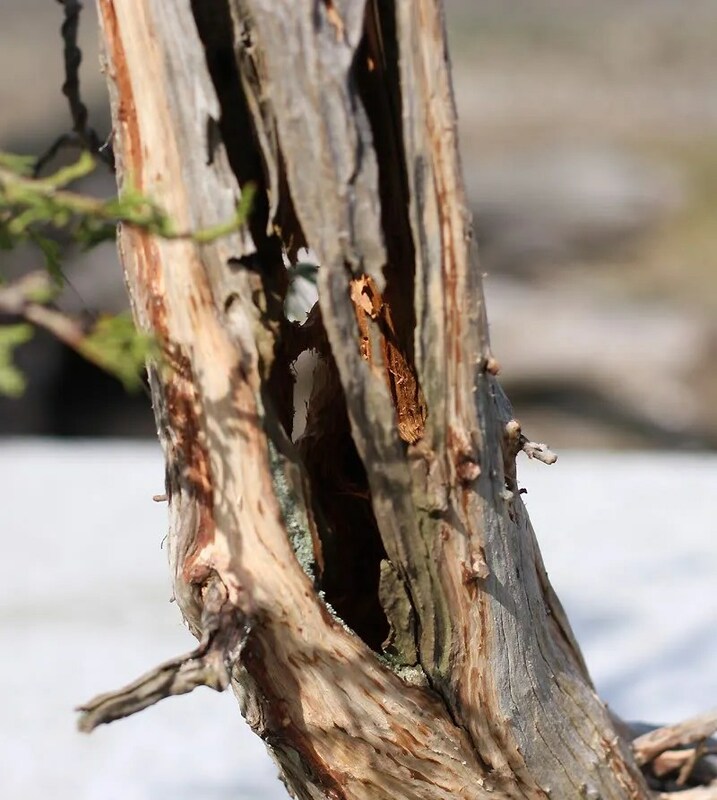 If you move a tree from a traditionally shady location, or remove a branch from a tree and it reveals an inner section of bark which previously has always had filtered or little light exposure, the bark in that newly exposed area may not be thick enough to cope. If you notice a section of bark is looking unhealthy, discolored or even flaking off to bare wood – but otherwise the overall tree looks fine, that area of bark has likely died. (It is important never to let bark remain over areas of the trunk which you know to be dead. The porous nature of a tree’s vascular system allows water to be absorbed and held against the tree, causing eventual rot.) When previously kept from long exposure to full sunlight, even sun tolerant species should always be gradually exposed to increasing light in order to give both foliage and bark an opportunity to build up protection to the exposure. Stress from too little light will produce lackluster growth that will often also look very anemic. Leaves that are present will also likely be enlarged to create more surface area to catch light. Inner branches and foliage will also tend to die back, as there isn’t enough light to filter through the tree to keep them viable. Getting enough light inside the canopy to the inner branches is key to keeping healthy foliage close to the trunk. Stress from wind exposure is most dangerous in freezing weather as sub-branches and buds can die when not protected from cold dry winds. Conversely sustained winds in hot dry times will desiccate leaves. Keeping trees in places where they will have protection from heavy wind is always advisable and in extreme conditions crucial. Water, light, and air… are all basic to keeping trees alive. When these elements are in appropriate measure for the trees needs, the result is great health and resistance to disease. Imbalance in any of these things will distress the tree, and when let go too long, often it can take years to bring a tree back to health again – if at all. As mentioned earlier delaying the re-potting of a tree causes leaves and sub-branches to get smaller with progressive growth cycles. This is very beneficial to producing a refined image in a tree. Root pruning itself is a stressor… though it often leads to vigorous health, its timing is critical and the amount of pruning to be done is very dependent on a thorough knowledge of the tree’s species, general health, and its history. Constant root pruning can kill a tree, because removing roots is the removal of energy reserves which is stored in those roots… doing it out of its time can kill a tree… some trees need to be root worked in stages, which can be done by taking out wedge sections of the trees roots rather than going through all the roots all at once. Some trees don’t flinch no matter what you do to their roots. Know your tree species before doing anything radical. 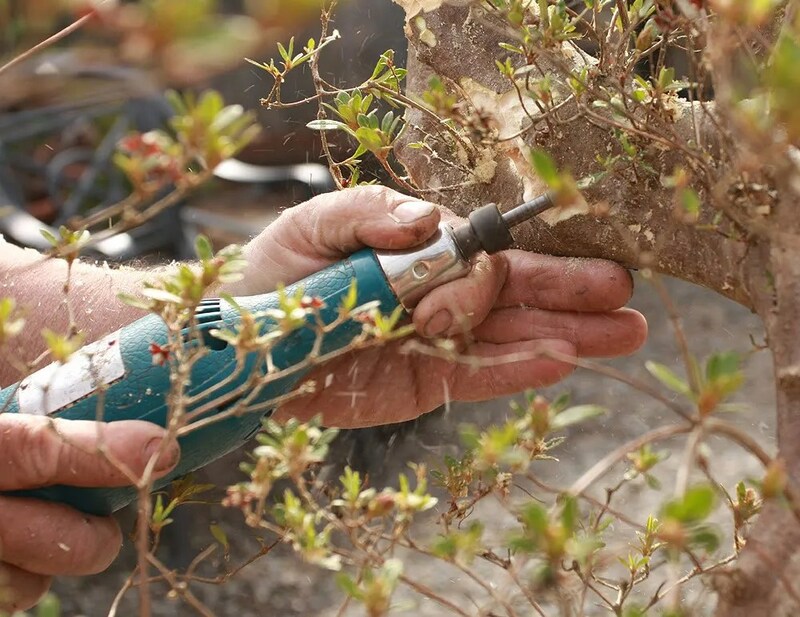 Hard pruning the foliage and branches of a tree species which is known to back-bud on old wood will stimulate the production of new buds and let you introduce taper into the structure of your tree. Timing is very important in this activity… to do this to a great percentage of the tree at the wrong time, can kill or seriously damage the health of your tree. 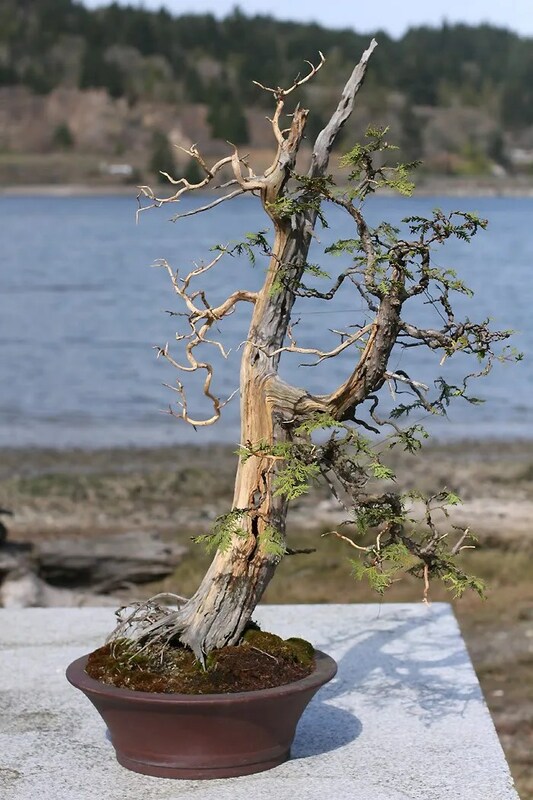 With certain species like hinoki it is virtually impossible to stimulate back budding on old wood – so never remove all foliage from a branch. Be sure to know your species characteristics before hard pruning a tree. Limiting food and water to control growth is not an uncommon practice among those who are attuned to the needs of the tree they are doing this too. In fact, certain species cannot be induced to heavy flowering unless they have a “drought period”. As always, the health of the tree is a critical factor in ever deciding to limit the tree in this way. Wiring and bending branches are all injury causing actions. It is the activity of moving branches… slipping the cambium away from the sapwood to be able to move the branch significantly that causes minor damage which then heals and stiffens the branch into the new position. Not being attentive to your wiring in the season wood is added to your tree can cause damage in the way of wire scars as the tree swells around the wire. Wire is a temporary means to a temporary end (all trees need wiring work repeatedly throughout their existence). So don’t get too wrapped up in what kind of wire to use as long as it’s effective and you know how to work with it. Aluminum is great because it’s easily applied and removed, and can even be reused in some cases. Copper is great for fine work and trees which you want to be able to show formally. Copper also has great strength in a smaller gauge but is harder to handle and is more difficult to apply and remove. Creating deadwood and scars are stressors which should not be performed on weak trees… as each wound will take energy from the tree to heal the wound. In fact… no intentional stressors should be performed on trees which are not in optimal health. Collecting trees from their natural growing environment can be a great stressor. It can take years of patience to get to the point of being to work on a spectacular collected specimen. 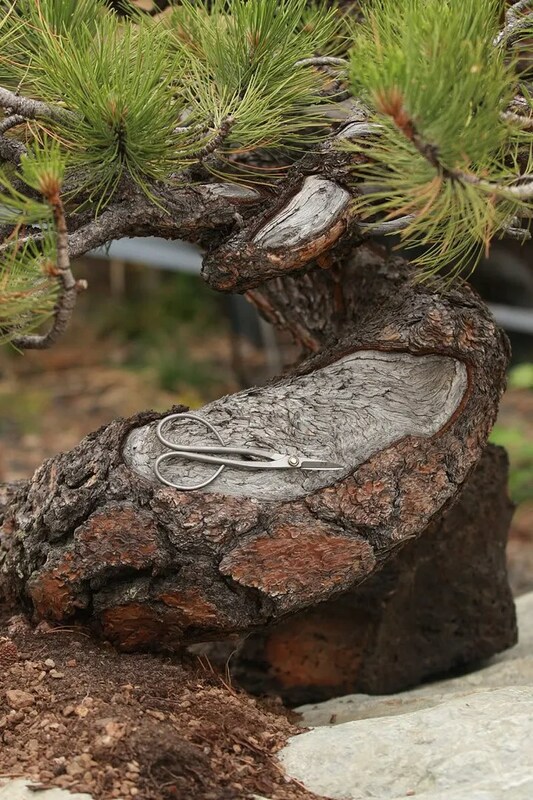 Some trees are easily freed from natural pockets in stone with nearly all roots in tact… but for the most part, only time will tell if the tree will survive the collection process, which is why preparing the tree for collection in the ground is an important step to take if it is possible. It is not unknown for it to have taken an entire decade to prepare for collection a single magnificent tree. The patience exercised ensured the greatest chance of success for the artist’s efforts. Do not be surprised for it to take 3 years or more to safely say a tree is ready for work post collection.